Hifei Capacitor Bank with connections for running Parallel battery packs. Includes 8mm Bullet Connectors & Anti Spark Point for Brushless Esc's. 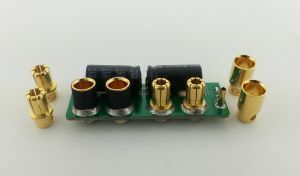 This capacitor board was designed to simplify the installation of Parallel Battery packs and esc's with two sets of battery wires. Simply solder the two sets of esc wires to the capacitor board tabs (see second picture). Then solder the included 8mm plugs to your two batteries.This is far easier then you having to make a special harness for the parallel packs. 63 volt Capacitors. Recommended for up to 14s Maximum. 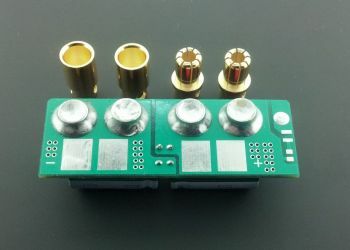 Instructions for Anti Spark Point: First, to connect battery negative connector to negative connector on the board, then put battery positive battery connector on the anti-spark point for 3 to 5 seconds, then immediately plug battery positive connector to positive connector on the board.